I found this tool while browsing some german ROM hacking sites, as I'm also dabbling with german Pokémon ROMs. 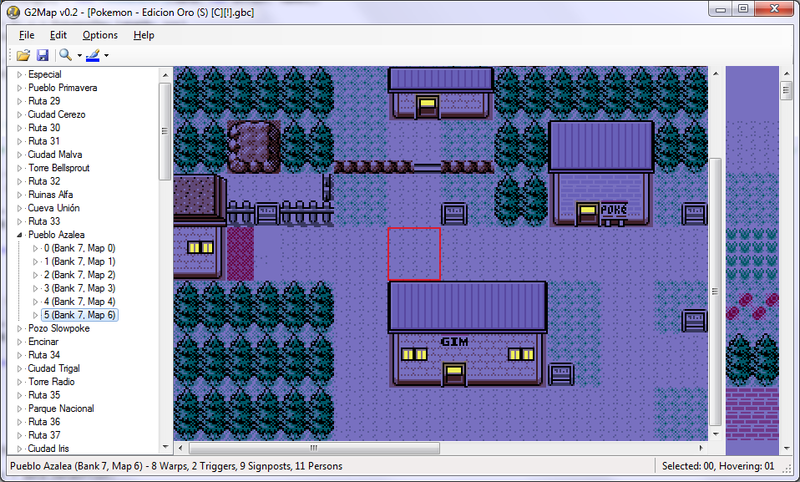 It is a Gen2 map editor capable of doing almost everything GoldMap can do. Further ROM support is apparently being planned (Italian G/S, European Crystal(whatever that means)). It is in an early development stage right now (v0.1 was released just a few weeks ago), so there might be some bugs present, but it might be worth keeping an eye on. G2Map is written by xdaniel. since xdaniel has resurfaced with a new version of G2Map, I thought i'd share the link since so as to make it more accessible. Gonna check this out, looks cool. Hey there, this is xdaniel, the author of G2Map. Hope it's alright that I dig this thread out instead of making a new one? ...of course, G2Map is still missing a lot of features. So far, you can edit maps, move events, change certain map properties, and change wild grass Pokemon, pretty much all of which is already in the build I originally released way back when. What I'm so far planning to add is editing of tilesets (i.e. tile makeup of blocks, collision, etc.) and wild water Pokemon, support for alternate roof tiles, as well as to fix certain bugs it has. I remember checking out your tool back then. It feels pretty handy for especially hacking crystal as a rom file, not sure how the mapping is done with disassembly since I have never really used it. Johtomap works really well for G/S hacking though but you could of course pick up something it doesn't do already and implement more features in this one if you're into it. It is very interesting to finally have an alternative to Crystal. The tool doesn't open the spanish version of GOLD, think it's possible to repair it, as long looking for a map editor for spanish roms? Miksy91: It doesn't support the Crystal disassembly yet, but someone else already suggested I should look into supporting it. As for adding features... well, I guess at least getting feature parity with JohtoMap would be nice. Also, is there anything in particular that JohtoMap doesn't do, and wouldn't be too hard to implement, that you'd like to see? The Spanish ROMs, as well as all the others in the list I gave in my last post, will work in the next version I'll release. Not sure when that'll be exactly, but hopefully soon-ish. Just kidding. Thank you very much for turning your project in the first Universal MAP editor. I know that Johtomap does not support extended tilesets, or pallet assignments that have been repointed to a new bank. MegaMap/ZeroMap support those things however. I don't know if Gen II map supports these or not, but they would be nice things to have support for. You can also add tileset editor that supports 192 to 256 tiles without changing DPI Setting like TSE. Mateo: Support for extended tilesets - at least for Tau's variety; don't have HyperHacker's to test - is work-in-progress; tested it with Chamber_'s Pokemon XY Naturia hack and that appears to be working fine. Palette assignments are still hard-coded to load from bank 0x02 (GS) or 0x13 (Crystal), tho. Do you know where the bank number is defined in the ROM, i.e. how'd I go about detecting the bank instead of leaving it hard-coded? RED: The tileset editor is work-in-progress right now as well; I'll make sure that you can use every valid tile in the tileset with it. Palette assignments are still hard-coded to load from bank 0x02 (GS) or 0x13 (Crystal), tho. Do you know where the bank number is defined in the ROM, i.e. how'd I go about detecting the bank instead of leaving it hard-coded? The banks are attached to the palette map functions. This isn't much help since the location of their bank 0 aliases varies between languages. While we're here, the blocksets seem to be laid out so they're easiest to use 4 blocks wide. Maybe this could be customized. Same with the block editor. With knowledge of these times and your desire to make things right, this tool easily become the best map editor. The G2Map will have support with PKSV like JohtoMap? Is possible, that like palettes, read the Tileset headers from the root? anticipation a possible expansion of the game. Also, the palette assignments aside, the block selector panel can now be resized horizontally, in single-block increments. Chamber_: PKSV is "Pokemon Script Viewer/Editor", right? I've never actually worked with scripting, so I'll have to take a closer look at this first. I mean, I've read some of Tau's scripting compendium, but the last time I was really working on a hack myself... I'm not sure if that or any other scripting document even existed yet, or if they did, they were still very new... It's been a very long time. Now, what do you mean by "reading the tileset headers from the root"? I'm not sure if I understand? ^^" Do you mean moving the table with the tileset headers elsewhere in the ROM? If that's the case, the offset where the tileset headers can be found is currently still hard-coded into the program for each version of GSC. I will probably move all this hard-coded stuff into a separate XML file, like the translations, so that people can add support ex. for their own hacks themselves, where certain data might have been moved (ex. map pointer table, tileset headers, wild Pokemon, etc.). 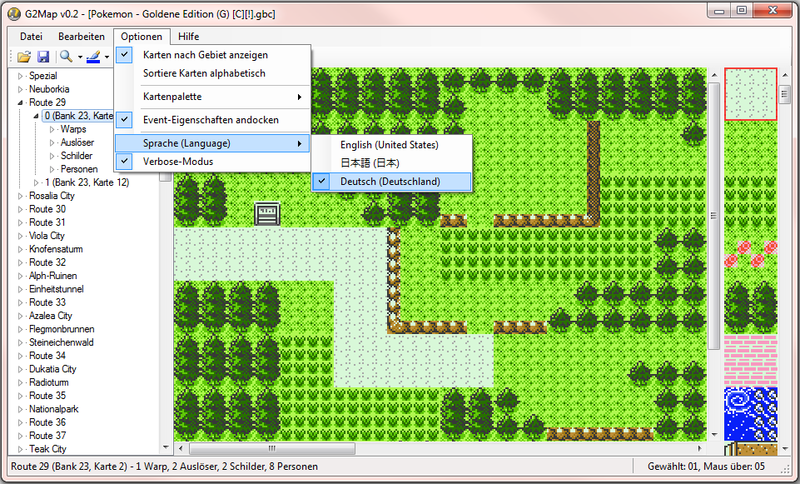 @xdanieldzd: Yes!, the pKSV is the "Pokemon Script Viewer / Editor". No need know anything about scripts to give support to your tool, take a look at JohtoMap for you to realize how it works. Basically, JohtoMap read the address of the script pointer and indicates to PKSV to open in the same address. I want to move the table of tileset_headers elsewhere in the rom to expand the number of graphics, so I think the BEST idea in the world to give "hand support" using an XML file. Great work on this utility I was already using G2Map v0.1, it's great to hear that there will be a v0.2! You already have a "Show script" button in the Persons dialog which is always disabled, if you could allow us to set a path to the PKSV utility then you could send the address and rom location to PKSV and then we can easily view the script without having to type the offset every time. I also recommend adding such a button to the Triggers and Signposts dialogs. This way you won't have to write your own "Show Script" utility and we can work with the utility we already use (and possibly develop new ones that use the same command-line syntax). Nice to see that there will be support for the Tauwasser variety of extended tilesets as well as repointed pallet data. Also, resizing the block window is a really nice idea. 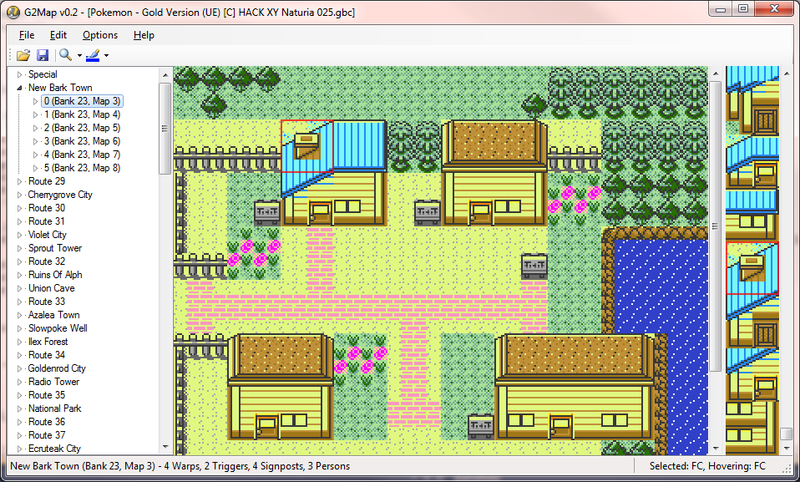 This is quickly becoming one of the best map editors for Gen II from the looks of it. I'll try to stop by more often to keep my eye on this. A quick status update: I haven't worked on G2Map a whole lot over the last few days, but I did add support for script editing via PKSV earlier today. The "Show Script" button is now labeled "Launch Script Editor" and is available for triggers, signposts and persons. If the path to PKSV hasn't been set yet, you'll be asked to locate the program's executable, otherwise it'll be started with the current ROM's path and the script's location as parameters - pretty much exactly how JohtoMap does it. Here it is in action (and disregard the changed map, this is from my testing ROM). In addition, G2Map will try to detect whether the current ROM file has been modified by another application while it's running, such as PKSV, and ask you if you want to reload the ROM. Though I did think it was handy to be able to see the ROM offset of a script without needing to open another utility or calculate them myself. Also, did you correct the byte order of pointer values in those dialogs? The two bytes for pointers are actually in a reversed order in the ROM and G2Map displayed those values directly which makes things a bit confusing. It's even worse than that, I noticed that the Japanese version of Crystal often requires you to use the Gold/Silver encoding instead of the Crystal encoding. - A sneak peek in form of a "beta-ish" build for you guys to test out will probably come soon, not least because some feedback from hands-on testing, regarding the newly added features compared to v0.1 in particular, would be quite useful to have. - I did change the byte order of the script pointers when I reworked the event properties dialog, yeah; I'll likely change it for the other instances where pointers are displayed in the program, too, like ex. in the map properties dialog. I notice you've kept the Flag Index and Flag Bit fields from other editors. These are actually one 16-bit value. It looks like Treehouse took some liberties with event scripting in Crystal and added commands of their own (namely 3writetext). JP Crystal already had new commands to begin with, and the Korean version is probably different too. score_under stopped working on pksv a few years ago. He released the source to pksv-ui, but not the backend. If you bug him he'll probably give it out. I would like to help test the tool before the official version is releasedt, especially with the Spanish language. You can add support of overworl graphics? First that is look into the map like a Johotmap, and second, support the expansión of graphics to look at the new additions without trouble. comet: I can merge the two Flag fields into one, sure - and it's these flags, right? In fact, what's the most up-to-date document about event properties, so that I can make sure the descriptions in G2Map match up with how each of the options is commonly called? Sorry if I might be sounding a bit n00b-ish here, but this is more or less my reentry into GSC hacking after many years ^^"
Chamber_: An editor for the Johto and Kanto overworld maps? That's a good idea, although it probably won't make it into the next version just yet. Speaking of which, what I do want to finish up before posting a test build is 1) the tileset editor and 2), as mentioned before, putting all the version-specific offsets into a separate XML file. Once those are done, I'll post a build for everyone to test. Yes. Here's a list of some of the event flags in Crystal. A significant amount of the missing flags are items. Naming the rest is a matter of looking up where they're used. And this also does not cover the event flags in the Japanese version.